What If Queen Latifah Had Announced She's Gay? Hypothetically, let’s say that Queen Latifah had announced that she is a lesbian during Macklemore's snooze-worthy "Same Love" performance on the Grammy's Sunday night. If she'd broken the unspoken rule of keeping her open secret, how would her world have changed? Maybe Madonna would’ve been to hit those "Open Your Heart" notes? But seriously, so many on my timeline were hoping to see the Queen walk through the looking glass and, instead of facilitating those strangers' ceremonies, maybe welcome her own lady friend to the stage. Let’s say she did and go down the rabbit hole, shall we? The Queen Latifah Show would’ve aired this morning and CBS, the parent company, would’ve waited with baited breath to see if their host's newly announced sexuality would boost or destroy their ratings. But since the show’s already been renewed for a second season, it'd probably be a publicity nightmare if they backed out now. 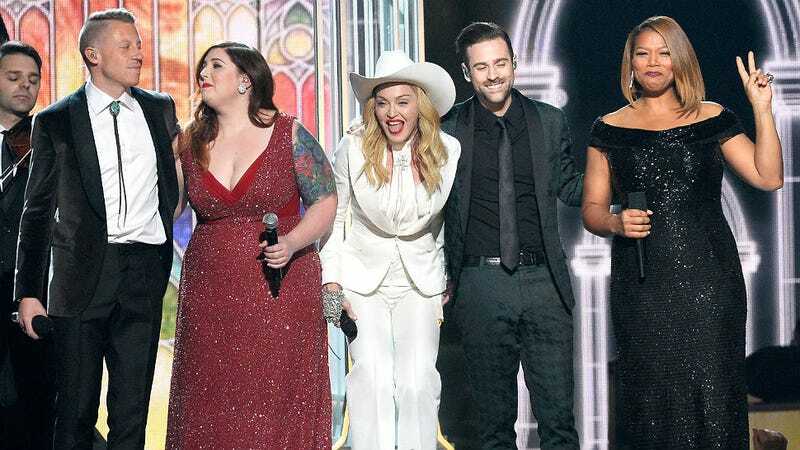 Meanwhile, the Latifah Show producers would gleefully pray that now, instead of Ellen and Neil Patrick Harris, Queen could become America’s new gay. The CBS brass would busy themselves thinking of all the shows they could organize around the evergreen gay marriage debate. Because, following Queen’s Grammy announcement, all of those conversations are fair game now without that awkward silence surrounding her own opinion. In contrast, Queen’s hypothetical announcement might shut out an audience that disagrees with her sexuality, namely black conservatives, and they might withdraw their support for her, both on the small and big screen. There would be oodles of think pieces on what it means for Queen to be black and gay in pop culture's landscape. Some pastor somewhere would probably preach a fiery sermon against her and her "lifestyle" next Sunday morning right before the Super Bowl. Elsewhere, little girls of color, who don't want to tell people that they like girls because they don't want to be bullied like Janis Ian from Mean Girls, will have a freshly minted example of a gay black woman who has a great relationship with her family and a successful career, not to mention a pioneering place in hip-hop. "U.N.I.T.Y" is a classic and unlike Hot 97 DJ Mister Cee's muddled self-perception, her clear declaration will drag hip-hop into 2014. Fans and companies financially involved in the culture alike would have to get down or lay down because of the Queen's powerful and lucrative place behind the camera through her Flavor Unit production company. In 2010, her crew produced a movie called Just Wright starring Common and, as fine as he is God bless him, he can barely act! That's power, guys. On the advertising side, Queen's admission would be great for her brand. With Cover Girl and Pantene contracts already in play, their corporate lawyers would become embroiled in a bidding war to lock her in down the line because MAC Cosmetics would be beating down Queen's door. The gay friendly company would definitely want her to participate in a new shoot with RuPaul for this year’s Viva Glam lipstick to raise money for the fight against HIV and Aids. Unlike gay black comedian Wanda Sykes who announced she was gay a few years ago, reporters would contact Queen every week for comment on each and every gay rights issue. If she says something smart and popular, the world will applaud, if she doesn't have a pleasing answer, the gay activist contingent will scream about how she is a waste of space. Hey, she will probably think to herself while watching a Melissa Harris-Perry roundtable is discuss her very existence on TV, maybe America isn't progressive enough for one person to represent their own opinions, and not those of every gay black woman and person around the world. But alas, Queen Latifah did not broach the subject of her own sexuality at the Grammy's last Sunday and her open secret lives on. ps. One question: is Queen legally able to join people in matrimonial union? Will that dramatic TV moment stand up in a court of law, when one of those couples inevitably gets a divorce? Just curious.